Here is a brief update on the progress of our latest air traffic control game, Airport Madness 3. We are putting on the final finishings to this product, as well as final testing for problems. We are aiming for a release date of Friday, June 25, 2010. Airport Madness 3 will have a sticker price of US$9.99. There will be a free version available in early July. Unlike the full version, which offers a one-hour ‘level-based’ exercise as well as ‘continuous-play’ mode and ‘challenge mode’, the free game will offer a sudden-death ‘How much traffic can you handle?” challenge that gradually builds in intensity and complexity. The free version will exist on Facebook as well as a variety of game portals on the internet. 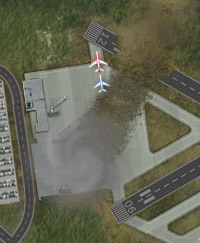 This entry was posted in airport madness 3 on June 8, 2010 by admin.